I've always said that one of the best things that can happen to a young Catholic is to room with a fiery non-Catholic Christian antithetical to Catholic doctrine. This can do a lot to force a Catholic out of his usual lukewarm complacency to defend his faith. Soon, however, he finds himself unable to do so, because he does not know that faith, and this can move him to study it more fully in order to defend it. What follows are a few basic principles that a young Catholic can think about should he find himself in such a predicament. One of the most basic points of contention about the Catholic faith concerns the authority of the Pope and bishops, what Catholics refer to as the Magisterium. Non-Catholics operate under the principle that Scripture alone is the sole rule of the faith, not any human being or tradition. How does a Catholic respond to this? Firstly, if a person believes that Scripture is the word of God, then indirectly he or she acknowledges the authority of the Church. Why? Because Christ did not establish a bible, he established a Church, and the New Testament arose out of the very life of the Church. Consider the gospel of Matthew, chapter sixteen. When Jesus went into the region of Caesarea Philippi he asked his disciples, "Who do people say that the Son of Man is?" They replied, "Some say John the Baptist, others Elijah, still others Jeremiah or one of the prophets." He said to them, "But who do you say that I am?" Simon Peter said in reply, "You are the Messiah (Christos), the Son of the living God." Jesus said to him in reply, "Blessed are you, Simon son of Jonah. For flesh and blood has not revealed this to you, but my heavenly Father. And so I say to you, you are Peter (Petros), and upon this rock (petra) I will build my church, and the gates of hell shall not prevail against it. I will give you the keys of the kingdom of heaven. Whatever you bind on earth shall be bound in heaven; and whatever you loose on earth shall be loosed in heaven." Then he strictly ordered his disciples to tell no one that he was the Messiah. We can learn a great deal about the papacy from this text. First of all, Jesus asked his disciples: "Who do people say that the Son of Man is?" Note the answers he received. None were correct. In other words, the truth about Christ does not come to us from the people. That is why the Church is not a democracy (from the Greek demos, which means "common people," and kratos, or rule). Christ then asks them: "But who do you say that I am?" Simon speaks up and says "You are Christos, the Son of the living God." Jesus points out that it was not flesh and blood that revealed this to Peter. In other words, Peter did not figure this out through his own natural intelligence. It was revealed to him by the Father. In other words, the truth about God comes from God, not from man. Nevertheless, it comes to us through man; not just any man, but through that person the Father has chosen to preserve the truth about Himself revealed in the Person of Christ, in this case, Peter. Thus says the Lord, the God of hosts: Up, go to that official, Shebna, master of the palace, who has hewn for himself a sepulchre on a height and carved his tomb in the rock: "What are you doing here, and what people have you here, that here you have hewn for yourself a tomb?" The Lord shall hurl you down headlong, mortal man! He shall grip you firmly And roll you up and toss you like a ball into an open land to perish there, you and the chariots you glory in, you disgrace to your master's house! I will thrust you from your office and pull you down from your station. The king of Israel had a cabinet of ministers, just as the Queen of England has her cabinet of ministers. From this cabinet, the king of Israel (the son of David) would appoint a first minister, or what we would today call a prime minister. This first minister was to be the master of the House of David, and so he would receive the key of the House of David. This key symbolizes authority as would the giving of keys to a person today also represent a kind of empowerment. The first minister was a father to the "inhabitants of Jerusalem". To be a "first minister" was to occupy an office, which means that the first minister can have a successor, as Eliakim succeeded Shebna. Now Jesus knew this text of Isaiah, and he is the true Son of David, the true King of Israel who, in Matthew, selects his cabinet of ministers, twelve in number, to represent the New Israel - the first Israel was a nation of twelve tribes. From this cabinet Jesus selected a first minister, a "master of the palace", namely, Peter. He gave Peter the keys of the New House of David, the keys of the kingdom of God. Hence, Peter has a certain authority, and he is a father to the inhabitants of the New Jerusalem. The Italian word for father is papa, from which is derived the word "pope". And finally, this station is an office, and so Peter will have successors, as Eliakim was the successor of Shebna. Furthermore, it is very possible for a person to hold this office unworthily - anyone who knows the history of the Church knows that there have been corrupt popes in the past. But the office is clearly distinct from the person occupying it, as Shebna was corrupt and was to lose his position to Eliakim, who would assume the office. Christ established a Church on the foundation stones of the twelve Apostles (see Eph 2, 20). The Apostles are the official teachers of the Church. They form that part of the Church that Catholics refer to as the Magisterium (from the Latin magister: chief, director). The charism of infallibility is a gift given by Christ to the whole Church (see Jn, 16, 4-13). It is a gift that is ours, if we belong to his Mystical Body. Just as sight belongs to the entire living organism, yet requires an organ if the power of seeing is to be realized, so too the charism of infallibility that belongs to the entire Church requires an organ in order to be realized. This organ is the Magisterium, the official teachers of the Church, which is made up of the successors of the Apostles, that is, the bishops and Pope. If we hold that Scripture is the word of God, we need only ask ourselves who it was that put together the canon of the New Testament in the first place. Or better yet, who wrote it? The gospels and epistles all came from the Church. They are the writings of the early Church, and it was the bishops of the Catholic Church that assembled the Canon -- in the late 4th and early 5th century -- and decided which books and letters were to be included and which are not to be. To hold to the Scriptures as the word of God is to affirm the authority of the Church, at least indirectly; for the bible is the Church's family heirloom. And so for the Catholic, there are three sources of faith: the Magisterium, Sacred Tradition, and Scripture. Christ established the Church, but the Church teaches in history, as the New Testament gives witness. In other words, Scripture is already the living tradition of the Church. 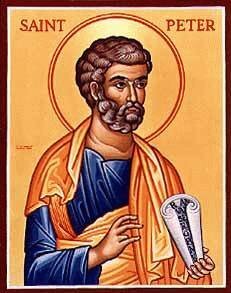 The first gospel written was Mark, written around 70 AD; a little later Matthew was written, followed by Luke. The gospel of John was written near the end of the first century, and it reads very differently than the first three synoptic gospels, and Matthew is very different from Luke. What they give witness to is the living historical tradition of the Church. It is the living Church in history who teaches, and she teaches the truth. We know this because Christ promised this to the Church. If we turn to John, chapter fourteen, we read: "I will ask the Father and he will give you another Paraclete - to be with you always: the Spirit of truth, whom the world cannot accept, since it neither sees him nor recognizes him; …" (14, 16). Also, a little further on we read: "When he comes, however, being the Spirit of truth he will guide you to all truth" (16, 13). What we need to remember here is that John is reacting to the heresy of Gnosticism, which denied the goodness of the flesh. Gnostics denied that God created matter, and so they denied that God would become incarnate in Jesus. That is why John emphasizes the goodness of the body throughout the gospel; i.e., note the story of the doubting Thomas, how Christ invites him to touch his hands and his side. All throughout the gospel of John we are reminded of the goodness of matter. The point is that Christ could not have been referring to individuals when he said "the Spirit of Truth will lead you to all truth". The Gnostics did not have the truth. Christ was referring to the Church that he established. He commissioned the twelve to go out to all nations and teach all that he taught them: "Full authority has been given to me both in heaven and on earth; go, therefore, and make disciples of all the nations. Baptize them in the name 'of the Father and of the Son and of the Holy Spirit.' Teach them to carry out everything I have commanded you. And know that I am with you always, until the end of the world!" (Mt 28, 18-20). It is this command to go out to the whole world (all nations) that marks the Church that Christ established, which is why that Church came to be known as "Catholic", from the Greek word katholikos (kata "about", and holos, "whole"). In the year 110 A.D., not even fifteen years after the book of Revelation was written, while on his way to execution St. Ignatius of Antioch wrote: "Where the bishop is present, there let the congregation gather, just as where Jesus Christ is, there is the Catholic church". The Church believes that when the bishops speak as teachers, Christ speaks; for he said to them: "He who hears you, hears me; and he who rejects you, rejects me" (Lk 10, 16). St. Paul in his letters also warns the faithful to hold fast to the tradition they received: "We command you, brothers, in the name of the Lord Jesus Christ, to avoid any brother who wanders from the straight path and does not follow the tradition you received from us" (2 Th 3, 6). The Church is a body, and a living body is characterized by unity. It is organized, as all organisms are. But a corpse decomposes. We are members of a larger body, and it is not for us to separate ourselves from this living body because we see things differently from the official teachers of the Church. St. Paul urges the faithful: "Make every effort to preserve the unity which has the Spirit as its origin and peace as its binding force. There is one Lord, one faith, one baptism; one God and Father of all…" (Eph 4, 3-5). The Christian faith is an ecclesial faith. St. Paul points out that prophecy, although a charism belonging to an individual through which the Holy Spirit manifests himself, is subject to the judgment of the larger community: "Let no more than two or three prophets speak, and let the rest judge the worth of what they say" (1 Co 14, 29). There is an obvious problem with dissent that is based on the principle of sola scriptura. The non-Catholic Christian reads the bible and insists that the bible is the sole rule of his faith. As is often the case, he comes up with an entirely different interpretation from that of the official Church. But some other lady reads the same bible and comes up with an interpretation entirely opposed to the other two. So far we have three people, and three different interpretations. Given four hundred people reading the same bible and interpreting it on their own authority, we end up with four hundred different and often conflicting versions of Christianity. One person believes Jesus is God the Son, fully God and fully man, but another denies it, insisting that he is not equal to the Father, that he's just human, but God is present in him in a special way. Another says Jesus is God; he has a divine nature, but not a real human nature. One insists that it is good to pray for the dead, another denies it. One says it is good to pray to saints, others say no. Who is right? They can't all be right. Who is going to settle the dispute? Certainly not the bible. Who has the correct interpretation of the bible? Having received this preaching and this faith, as I had said, the Church, although scattered in the whole world, carefully preserves it, as if living in one house. She believes these things everywhere alike, as if she had but one heart and one soul, and preaches them harmoniously, teaches them, and hands them down, as if she had but one mouth. For the languages of the world are different, but the meaning of the Christian tradition is one and the same. Neither do the churches that have been established in Germany believe otherwise, or hand down any other tradition, nor those among the Iberians, nor those among the Celts, nor in Egypt, nor in Libya, nor those established in the middle parts of the world. But as God's creature, the sun, is one and the same in the whole world, so also the preaching of the truth shines everywhere, and illumines all men who wish to come to the knowledge of the truth. Neither will one of those who preside in the churches who is very powerful in speech say anything different from these things, for no one is above his teacher, nor will one who is weak in speech diminish the tradition. For since the faith is one and the same, he who can say much about it does not add to it, nor does he who can say little diminish it…. Since, however, it would be very tedious, in such a volume as this, to reckon up the successions of all the Churches, we do put to confusion all those who, in whatever manner, whether by an evil self-pleasing, by vainglory, or by blindness and perverse opinion, assemble in unauthorized meetings; we do this, I say, by indicating that tradition derived from the apostles, of the very great, the very ancient, and universally known Church founded and organized at Rome by the two most glorious apostles, Peter and Paul; as also by pointing out the faith preached to men, which comes down to our time by means of the successions of the bishops. For it is a matter of necessity that every Church should agree with this Church, on account of its pre-eminent authority, that is, the faithful everywhere, inasmuch as the apostolic tradition has been preserved continuously by those faithful men who exist everywhere. It should be pointed out that there is also such a thing as "internal dissent" that is a bit more difficult to detect. We have witnessed this kind of dissent since the Second Vatican Council (1962). Some people within the Catholic Church have taken a different path. Now, in itself, there is nothing wrong with this, for there have been many reform movements throughout the history of the Church, which began with certain people taking a new path or walking down a new road (i.e., Francis of Assisi, monastic reforms, etc.). Not all reform movements, however, remained faithful to Peter. Today there are people who many years earlier took a turn onto a trail that was thought to be the one the Church as a whole was treading. They felt that because they were able to detect movement in the Church, they were able to discern its direction. Many of these people regarded themselves as "prophets", in a manner of speaking, and although they did not visibly leave the Church, what they taught contained genuine elements of Catholic teaching yet stripped of so much that characterizes mainstream Catholicism. Their agenda also seemed to include attitudes and elements antithetical to the teaching authority of the Church. What happened was that eventually the Church began to articulate and clearly delineate a post-Vatican II understanding of herself. We saw this in the Encyclicals and writings of Pope John Paul II, as well as the 1994 Catechism of the Catholic Church, which the Holy Father (John Paul II) said is "a sure norm for teaching the faith and thus a valid and legitimate instrument for ecclesial communion." What we eventually came to see was that some trails really did express the direction in which the Church as a whole was moving, while others were dilapidated. It is no coincidence that those new paths that proved true to the Church had always stressed the importance of fidelity and loyalty not just to Scripture, but to Tradition and Magisterium. Those that proved defective regarded much of Church Tradition as outdated and irrelevant - and mistakenly thought Vatican II did so as well - and regarded the authority of ecclesiastical office, especially that of the Pope, as merely human and derived ultimately from academic achievement. The problem, however, is that when a person or group of persons takes a wrong turn and the longer one proceeds down that road, the more difficult it becomes to acknowledge that one has made a wrong turn, back up, return to the original spot and proceed on the right road, unfortunately behind many others who stayed the course. This is especially difficult for those who regarded themselves as prophets of a new age in the Church. What happens is such people will shout all the louder, all the while moving farther from the divergent point, their voices becoming less and less audible, until they are no longer heard from. This has given rise to an interesting phenomenon. Because many non-Catholic Christians are seriously devoted to Scripture as the inspired word of God, such as those old fashioned Baptists or Evangelicals, many of them seem more identifiably Catholic than the internal dissenters who remain within the walls of the Catholic Church. In other words, these "bible Christians" often have far more in common with mainstream Catholicism and more to share with mainstream Catholics than those who hopped on the bandwagon of internal dissent that was on the move just after Vatican II. It is best to remember that the Church operates according to an ancient working principle: lex orandi, lex credendi, which means "the law of praying" is the "law of believing". In other words, how the Church prays is a reflection of what the Church believes. That is why in order to understand what the Church truly believes, historians will look to the ancient liturgy, that is, how the Church prayed. But how does the Church come to know? She knows what to believe because She knows herself, that is, She knows how She is inclined to worship. The Church is not just a bunch of men who went to school, got degrees, and are now considered the experts. Individual persons are not infallible, even the best of theologians and Doctors of the Church -- the only individual who is infallible is the successor of Peter, when he speaks "ex cathedra" on matters of faith and morals. He is primus supra pares, not primus inter pares (He is the first above equals, not the first among equals). This, however, is a charism of office, not something that belongs to him by virtue of his education or personal accomplishments. But it is the Church as a whole that knows Herself and Her own inclination, which is expressed in Her liturgy; for the Church as a whole is Christ's Mystical Body, and She prays. The Church lives in Christ and is One Body in Christ, her Bridegroom. The Holy Spirit is the very soul of the Church, and the Church prays in history, throughout the centuries. In her, heaven and earth join, because in the Person of Christ heaven and earth were joined hypostatically, the human and divine natures joined in the One Person (hypostasis) of the Son. Heaven and earth continue to be joined in Her faith, the faith of the Church, and in Her prayer, that is, in the liturgy. She is a believing and praying Church, and Her self understanding is rooted there. Theologians are simply called to serve that faith. They have no dominion over it. They must be part of that faith in order to come to genuine theological understanding, that is, they must be a part of the believing Church vivified by the Holy Spirit in order to be theologians. All their judgments are subject to the teaching office, the Magisterium, which is the organ of that charism of infallibility that Christ promised to the Church and which belongs to Her as a whole. In fact, many of the great doctors of the Church would explicitly preamble their writings with such a condition, leaving everything they wrote ultimately up to the judgment of the Church. The reason that it is so important to have a Magisterium is precisely in the relationship between liturgy and faith (lex orandi, lex credendi). Error in faith will inevitably impact on how one worships, that is, how one prays, and how one prays inevitably impacts on how one lives and loves. Everything in the Church serves love, and genuine prayer carries us into the depths of God's presence where we find the world that God so deeply loves. Worship and intercession are bound together in a single reality. That is why orthodoxy is ultimately a matter of such grave importance.